Due to overwhelming demand, seating is limited! Round up your friends & RSVP Soon! Oldenburg Franciscan Center is a ministry of the Sisters of St. Francis in Oldenburg, IN. I mentioned Deepak Chopra in an earlier reflection. Here is another quote from him that got me thinking. He said he spent a month as a monk, following their way of life as closely as he could. What a lesson that is. How long in walking is one foot above the ground? I figure one second at the most. So to follow the advice of the head monk, we would have to take our “feel good” moments in increments of seconds. I tried it, and you know I could accumulate more “feel good” seconds than I thought possible. In fact after an hour of testing those tiny snippets of time, I felt pretty good about what was happening around me. It is so easy to concentrate on what is not pleasant and try to get rid of it, than it is to concentrate on what is pleasant and strive to encourage or add to it. I am a rather positive person. I enjoy life and humor and thoughtfulness. But I realized after that short test that I miss so many sweet happenings. For example, a little boy, maybe 3 years old, holding his Mother’s hand, lifted his other hand to me and waved. I did not know him or his family, and would have missed the sparkle that tiny action awoke in me if I had not been looking for good things. I was riding a cart to work, and slowed down because there were several birds busy and I did not want to disturb them. One sparrow tilted her head and looked right at me as if to say, “Thanks.” I never saw that before. How we look at things does make a difference. And if we do not look for lovely things, we may see only useless stuff. Keep your eyes wide open! p.s. 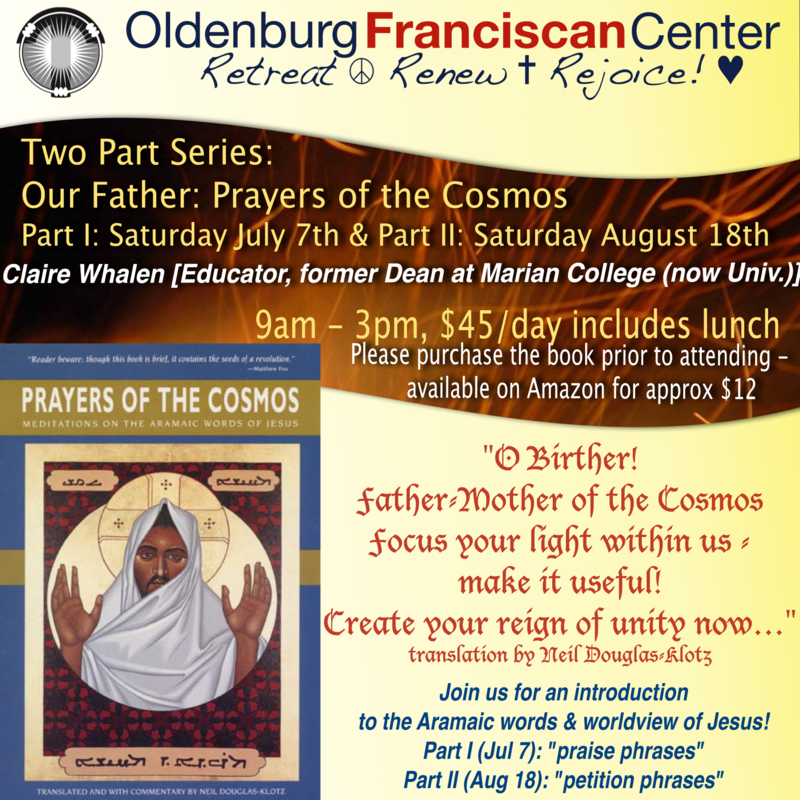 Join us July 7th to gain a deeper perspective of the Our Father based on scholar Neil Douglas-Klotz’ book, Prayers of the Cosmos. Have you ever held resentment in your heart? Perhaps it was for someone who hurt you by insulting remarks, or by neglect of you, or even lies about you. Every time you saw them or heard them or heard someone say something positive about them, you curled up inside and wished them something less than peace. A few weeks ago, I was having my hair done, and picked up a magazine in the shop. It happened to be Oprah Winfrey’s magazine, “O”. Besides all the numerous ads there was a very interesting article about an interview Oprah had with Deepak Chopra while she was in India. This great man of peace, who has written 65 books, was ready with that quote during this once-in-a-lifetime interview. That made me think. Is there anyone toward whom I hold resentment? I found in my memory two people. Both have gone to their heavenly rewards, but I quaver inside when their names come up and I have to hold my tongue to prevent telling the hurtful situations in my life with them. I keep drinking poison hoping it will kill the memory of whatever it was that estranged me from them. How ridiculous can I get? I keep the memory alive and therefore, I poison myself! I can just imagine what will happen when I meet these two people in heaven! I will have to look at my own sins and hurtful actions and perhaps see what a fool I have been. As I make my way across campus to the Retreat Center where I have a little office, I love to take note of the birds I encounter. My favorites are the wrens, so very small and active, darting here and there, seemingly always very busy. Their whole lives lie in the bushes, the lower branches of trees, and on the grass, pecking here and there for whatever will sustain them and their nestlings. Today I noted their small wings, perhaps just 2 inches long, and I wondered of the difference between them and their huge cousins the eagles. Six foot wing spans keep them soaring above the tallest trees and hills. The wrens do not, cannot soar. They dart. And the even smaller hummingbirds’ wings flutter so rapidly, you cannot see them. Why should there be such a difference of wings among the many species of birds? 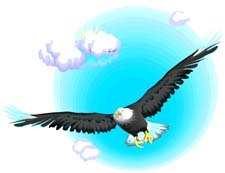 The very large eagle and others such are birds of prey. To sustain themselves they must search for food that can nourish and sustain their large bodies and powerful strength. This will not happen by nibbling at seeds. High above the ground they watch with their very sharp eyes for small animals that they can use to feed themselves and little ones waiting in the aerie. Flapping their wings rapidly would alert their prey, weaken their focus and make them clumsy to do what they must. They float on air currents and are beautiful to watch even while hunting. Now the very tiny hummingbird flutters because a balance must be maintained in order to reach the nectar it needs to survive. They do not float like the eagle, but hover in one place to reach the flower’s center. Their wings are just right for that. As for my favorite, the wren, it just darts here and there on the ground, flying ten or twelve feet or less. They are so small and earthen in color, it is easy to miss them. Shy little creatures that go about their business without intruding on anyone’s time or space, they are small and precious. We need them all. The bold eagles, marking strength and power, are held as the example for our country. The tiny rainbow-hued hummingbirds remind me of my mother as she prepared for guests. This way and that way she went, getting things ready. Afterward she would be exhausted and collapse into her sofa chair. The wren, and perhaps the robin and other smaller birds, are for me the mainstay. They go about their work everyday, do it, and do not grudge the doing. I think I would like to be like them. How about you? Are you an eagle, a hummingbird, or maybe a cardinal?! What is it that causes children and adults to think poorly of themselves? If we look at the impact environment has on every living thing, we may see something of the reason. Flowers without light do not flourish as do those with sunshine. If this happens when the plant is young, it may die. If sunshine does come eventually, it will not have as beneficial an effect as if it had been there from the beginning. A tree always in a westerly wind will grow leaning to the east. Even if a building is erected in the path of the wind, and the tree is no longer forced to bend east, it will still not straighten on its own. There would need to be some intervention to pull it upright. Pet dogs who have been hit by their masters will cower when a person raises a hand even to stroke them. That fear can stay forever. People react much the same. If the environment has been positive for them, they will feel good about themselves. If not, the results are the opposite. We all thrive when people are positive about us. Hearing only harshly negative things, or having our shortcomings dwelt upon can pull all the joy out of an otherwise pleasant day. From the day we were born, we have been taking in everything that happens around us. We listen, watch and gather information so that we can make sense of the world and its inhabitants. We learn what others think of us. And that comes from the things we hear them say, or their actions. Mistakes happen to all of us, and they happen every day. They are very often the way we learn. But how others respond to our mistakes will affect our own feeling about self. If you are a parent, let your children overhear you praising them to others. So that over the telephone when you say to Grandma, “I was so proud of Joey yesterday, He was a real peacemaker in the park. I think the other boys follow his lead, so it is just wonderful that he is leading in the right way,” Joey will smile inside and feel good. Now suppose your daughter overheard you saying to her teacher, “I just don’t know about Cathy. She doesn’t do things right at home either, I cannot tell if it is stubbornness or if she is just so slow she can’t do it.” Cathy will soon get the idea that she cannot do things well and she may become stubborn. For certain she will find it hard to try something new. If you are a teacher, encourage your students, ages 3 or 23, instead of pushing them. Find the good in them and build on that. All people make mistakes, so when they do, we would do well to try to minimize the wrongdoing and focus on the good things. Corrections have to be made, but attacks are not necessary. Gentle reminders usually influence much better than harshness. Find in yourself the gentleness of St. Francis, or Mother Teresa of Calcutta. Positive statements ought to be part of our everyday vocabulary. I’m sure you’ll do that, because you’re winners! All of you!